At the Institute of Biobehavioral Medicine (IBBMed) the cornerstone of our program is education, or re-education. We aim to provide a safe environment conducive to introspection and self-reflection; and we encourage our patients to evaluate their emotions, thoughts and behavior as it relates to their life story and make appropriate corrections in their core beliefs about themselves, their loved ones and the universe when indicated. We provide learning opportunities through therapeutic interactions as well as informative and interactive workshops, lectures and seminars. We guide our patients on a loving search for truth, both within themselves and their environment, gracefully accepting what is, without judgment or resentment, while embracing change. In addition we design wellness and psycho-educational programs for community and corporate organization, in order to promote health, wellness, intimacy and life fulfillment. 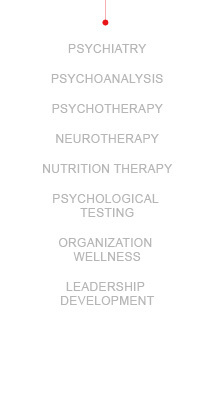 Our licensed clinicians also provide supervision and training to mental health professionals who would like to develop a holistic approach, sharpen their skills and strengthen their therapeutic techniques. Personal Healing: role of spirituality, forgiveness and grace in mental hygiene.